Welcome to Wetpixel Expeditions! All of the trips listed here are planned and run by Wetpixel staff and are designed to maximize photographic productivity. Our trips cater to advanced divers who are interested in learning more about underwater photography and typically include (repeat) photographers who are shooting at a high level. Private and commercial trips can also be posted in our forums. We look forward to diving with you! Want to see and photograph 100s of whale sharks? Wetpixel and Alex Mustard return to Lembeh for their fourth macro workshop! 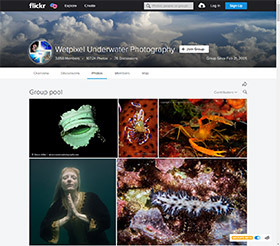 Wetpixel and Alex Mustard return to Lembeh for their fifth macro workshop! Wetpixel plans to organize a dive expedition to Antarctica. No details yet, but contact us if you are interested!